This is the end! Or is it just the beginning? Hmmmmm, how very meta. Our Cruising Catamaran Sailing Classes are coming to an end and we’re bustin’ tail to get from Miami back to the Marina in Ft. Lauderdale. To be honest, we’ve read dozens of sailing blogs, talked to fellow sailors and many of them skipped any sort of formal training or schooling. We originally thought we’d follow suit and skip sailing school too. “We’re smart, we can figure it out”, “We’ll watch YouTube”, “We’ll have our friends teach us”, these are a few of many statements we made before deciding to take a proper sailing course. Oh, how differently we feel now. Join us on our last day of class and see for yourself the progression of “day one” us, into “day five” us. It’s amazing what we can learn in less than a week when we have a good instructor and focus all our energy on one goal. We’ve always known it, but it’s a good reminder that Mother Nature doesn’t always accommodate our scheduled plans. With Sailing, a proper plan is extremely important, but patience is the most important virtue of all. If Capt. Jen didn’t need to be back, we would have hung out in Biscayne Bay and waited for the wind to pick up. With a little more wind we could have sailed instead of motor-sailed. From everything we’ve read and learned so far: Waiting on optimal weather seems to be the greatest difference between a relaxing and comfortable sail or a not so nice sail. A preventer can keep the boom from slamming in light winds. Motoring with only one engine gives us a decent amount of apparent wind while saving fuel. Nikki’s exploration into the front locker exposed way more rope than we’ll ever need. I realized I’m not too proud to give up the helm when I know Nikki’s skills are superior. Kent (our broker/friend) has a thing about not putting fenders down until the absolute last minute. Cruising around with your “New York Jewelry” hanging off the side is bad practice he would say. Captain Jen said the same thing. It’s good seamanship to keep your vessel tidy and neat. Waiting till you get close to the dock to drop the fenders is part of that. Along with patience, the need to keep calm under pressure is important. This cannot be more true than when maneuvering through a tight marina and docking in a slip made for a boat 5 feet shorter than ours. This is a statement echoed over and over by Kent when we’ve sailed with him: Slow and steady, no need to rush and keep calm. Fortunately, Nikki has navigated this marina multiple times over the past few months…but this is the first time we’ve had to take this middle spot in the back corner of the marina. I think she did a damn fine job staying in control while trying to squeeze our boat into the designated spot. With the help of the Tanda Malaika crew she got as close as humanly possible without causing any damage to the surrounding boats. This experience showed us again, we’re ready to begin this adventure on the water. Now that we’re on the other side of class we’ve been doing a bit of coastal cruising when we can get away from the service dock (we’ve been at Just Catamarans working on the boat on and off since school ended). Two days after class, Capt. Jen prepared an email of competency for our insurance company and within days of receiving her message our “Captain on Board Restriction” was lifted. This was our main goal with taking the class in the first place, but we ended up walking away with so much more. Is Sailing School Worth It? The confidence in ourselves and a better understanding of our sailboat helped us realize we did the right thing in starting this new adventure. We’ve always followed our dreams, but now we’re just a little more prepared for success. Previous sailing experience goes a long way! If you have a friend, or a local yacht or sailing club that holds events, you should join in! Every minute you spend on a sailboat you’ll inherently pick up little bits of knowledge that will come in handy during class. Fortunately for us, we’d been sailing quite a bit with friends the past couple months so we’d picked up a lot of the lingo and technique. The cost difference between our private class and the group class isn’t much so make sure you weigh your options before booking. On one hand sailing our own boat was a wonderful learning experience, on the other hand having 2 additional classmates might have made the class more fun (I think most classes are 4 students). Florida Summers are the Worst! Ok, maybe I’m being a little melodramatic but if you can take the course in a cooler season like winter, it’ll be a lot more comfortable. Check with your local ASA school about tips, some school’s instructors work for tips while others do not. With BWSS the recommended tip is between 10%-20%, an expense we didn’t originally plan for (even though I did find it on the FAQ page, but not until after class). Sailing School Before or After buying a boat? If you are thinking of buying a sailboat and don’t have much sailing experience…our suggestion would be to take a class like this first. We had planned to take this course first but the schedule was full and we ended up finding a boat faster than we expected. Having this knowledge and experience would have made a lot of our transitional frustrations way, way easier. 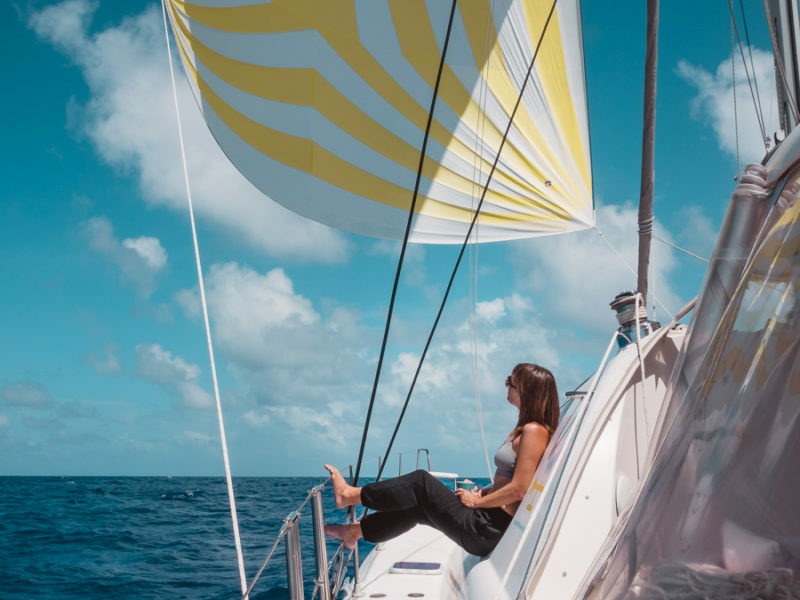 There is so much to learn about this sailing lifestyle and knowing the basics of coastal cruising will make a world of difference. We have so much to be thankful for in our nomadic way of life, but the biggest one has to be the people that weave their way into our lives. Thank you to Capt. Jen for agreeing to come aboard and be filmed for an entire week. Thanks to Dave at Blue Water Sailing School for allowing us to film and share our experience with other people who dream of sailing one day. Thanks to Terry Grimbeek for taking off a week of work (without pay) to join us and help film the adventure of learning. Thanks to the readers, watchers and subscribers…even the ones that never click that comment button to say hello, we couldn’t do it without you all! Finally, a BIG HUG to our Patreons, without you as our crew we’d have to focus on paid or sponsored content instead of creating authentic videos like these. We really put a lot of love into this series and we hope you all enjoyed learning with us. If you’ve had a good sailing school experience please share in the comments below, make sure you list the city and school in case others are in your neighborhood. If you’re a seasoned sailor and feel like chiming in with your own tips we’re all ears…we haven’t let our sailing school success go to our heads, yet. If you’re the owner of that boat in our docking spot and you want to send a bottle of high quality bourbon (as requested by Nikki) we’ll happily get you an address! Till next time, we’ll see you on the water. Marina: Harbour Towne Marina (we’re here for service with Just Catamarans). I’ve been watching all of your sailing videos and reading as much of your site as I can absorb…including Jason’s photography details (though I’m an amateur in that arena). My wife and I are sailors, and until now we’ve been sailing on OPBs. In a few weeks we will (hopefully) take ownership of our very own sailboat … a new Lagoon 42. 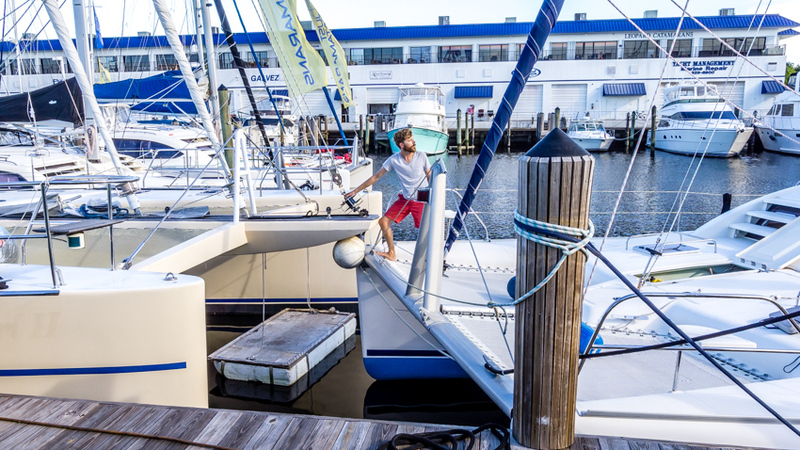 Despite our sailing experience, it seems the insurance company will require us to be formally certified before we can take her off the dock without a Skipper…and we plan to go thru an ASA training process similar to yours. How long (days, sessions, weeks, whatever) was your sail training? …and what certifications did you each finally end up earning? 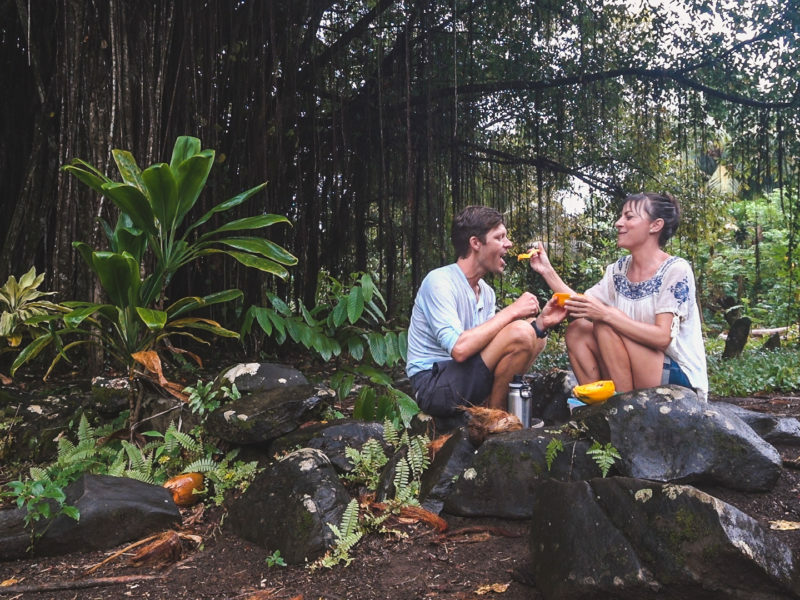 Would you mind divulging what insurance company you initially used and whether you have maintained that relationship now that you’re well into your adventures? Oops…Guess I missed that tab. I’ve been watching your recent videos for a couple months now and decided to start back at the beginning of your sailing adventures. I’m so glad I did, because now I found the class I want to take when my husband and I are ready to go cruising full time. Lots of reading (comments) time for a nap. Check out Episode 5! As you guys head in to dock you pass a 46 Leopard, “Tanda Malaika”! I’ve watched your RV Blogs and most of your sailing ones. Your content and style have improved considerably over time. It’s revealing that you two are professional in your methods and adventurous. I certainly commend you for stepping out of the “standard” life path and starting a journey of explorations that will allow both of you to grow and experience many of the cultures and environment of our wonderful world. It will be an amazing adventure to share your exploits even if it is only from my laptop at home. Your videos are fantastic. I love the water activities… I love boating be it powerboats or sailing rigs. I’been sailing/boating for over 50 years… What bothered me no end watch your training videos and especially with a professional instructor on board that none of you were wearing PFDs. Wearing a PFD is the number #1 rule for sailers/boaters. Shame on you…. Please wear your PFDs as they can/will save your life. If the USCG boards you they may say a thing or two about this. While the USCG requires you to have PFDs aboard, you are not required to wear them. Yes, I realize USCG does not make it mandatory for you to wear PFDs apart from you having to have them readily available onboard. I’m not trying to be argumentative here….. I’m trying to be helpful. Your sailing training was very helpful and instructional for people and especially for newbies like yourselves at the time you received the training. I don’t think I ever saw in the videos or in the writeup a single piece of information regarding the use of PFDs while underway. I think this would have been a responsible piece of information to have at least been mentioned and to have been inserted into your writeup. To make my point please see/read https://www.usps.org/eddept/files/other_20_handout.pdf. Thank you for making boating safe for all. Let me give you a personal experience… I was crewing on a 75-foot gaff rig yawl and sailing between souther cost of England and the French Normandy coast several years ago. We had a huge Yankee jib deployed and all of a sudden its leading edge (the luff) split and the jib flew up vertically placing a vertical load/force on its holding cleat. The cleat was wrenched out of the deck and was catapulted forward at high velocity toward me and hit me in the thigh. The pain was awful and I quite likely lost consciousness briefly and fell overboard. I was wearing my lifejacket thank goodness and in all honesty saved me from drowning. I did survive. Sailors are constantly on deck running about and sudden strong gusts can arrive without warning. If you’re on deck and a gust without little warning puts the boom over (and no one yells out “Jibe-ho”) and hits you in the head you’re likely to be thrown into the drink. + Barry Sharp Your concern is noted and you’re certainly not the first person to bring the wearing of PFDs to our attention. But this blog is meant to provide general entertainment, information and guidance – it is *not* meant to be full sailing instruction or even how to live on a boat. That’s a totally different type of content which should be left to professionals and there’s a lot of info available on the web if anyone is serious about sailing. Sailing School was fantastic and thorough and we highly recommend it to any new sailors, which was really the point of the posts. Wearing a PFD is a personal choice. If you choose to wear one at all times while sailing, that is your choice. On the day of the video, the instructor did not feel the need to wear a PFD because conditions didn’t really call for it. Skies were clear, wind was 5 knots, swells were around one foot, the water was warm, and there were multiple people on board to spot and guide the boat in event of a MOB. Curiosity does have brand new PFDs with individual AIS transponders and the crew has been wearing them in appropriate situations and will continue to do so. Thanks for the feedback but again, these posts are meant to be entertaining and “educational”, not “instructional”. I watch your RV adventure videos & now I’m hooked on this new adventure that you both have taken on. When I was younger, that was my dream to buy a sailboat and said the world. I had a book (forgot the name) about a young man sailing himself around the world & the places he made port at. I will continue to watch your videos and I want to Thank the both of you for bringing back those wonderful memories of the younger me. I think my class here in Canada was very similar, except we were in the Gulf islands, which are right beside the US border. So we learned about how the US chart data works and US regulation as well as the Canadian side of things. We also had a similar docking experience. We were in the first slip around the pier and we had to do a 180 between rows of boats in a mono hull. Then because the slip was just a little small we had fenders on both sides and we had to ram the boat in at half throttle. The fenders looked a bit ridiculous all squished up against the boat but we were in there nice and tight 🙂 . One trick we used a lot is to use correctly placed lines and the engine to get the boat on or off the dock. 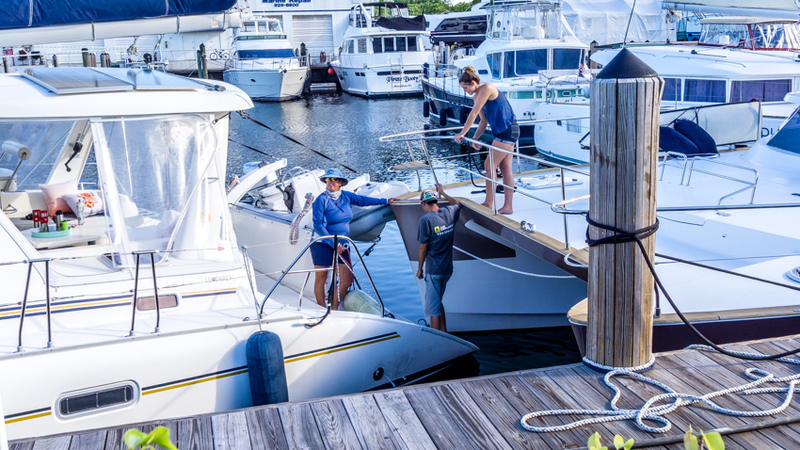 If you take a stern line attached to the dock around the center of the boat, reverse throttle and some fenders on the stern section, then the bow of the boat will pull away from the dock. That way you can pull away without hitting the stern and without moving forwards or backwards at all. Also if you take a spring line from the center of the boat and attach it to the dock around the stern area of the boat and use forward throttle, the boat will get sucked against the dock. This is really useful if the wind is pushing you off the dock especially when the wind is higher because pulling the boat into the dock, even with 2 people can be really hard. I don’t sail. I’m an RVer. But I love your videos and now I want to sail. All the best luck to you. Oh I would so sign up pro bono! Retired, sailing experience, photographer, video editor, and I cook 🙂 Florida native..I’m in! Wow! I am so impressed and inspired by your journey, way to go! LOVE following along with you! Great job on sailing school… happy and safe travels, and thanks for sharing! I haven’t written to you guys yet, we are RVers. I don’t think a boat is in our future?. But I am soooo worried (I know, no negative) with this hurricane. Hope you are all ok. Maybe you could just send a Okee dokee ? We’re all good. Kent at Just Catamarans setup a space for us at the dock and made sure all was well. Fortunately the hurricane hit the northwest of FL and we are on the Southeast. Wow. They are still using the same text book I had when I learned to sail 20 years ago. I’ve only sailed and motored little boats, and have been part of and have witnessed enough dock rammings to make my whole body clench when the video came to your tight docking. I am so impressed! Congratulations on your new certifications. Thanks for taking us armchair watchers along with you. The thing that has kept me coming back to your channel over others is how incredibly kind you are; to each other, to others around you, and in your outlook. Thanks for that! Happy sailing. My wife and I really enjoy your videos. We have signed up with BWSS for Ft. Lauderdale Sailing course in November. We are in scuba instructing and will be retiring soon. 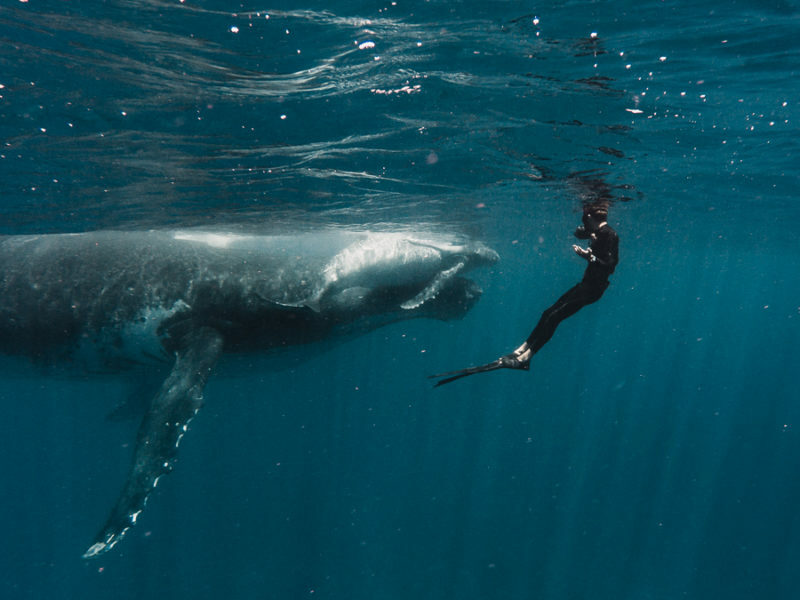 Our goal is to follow your example, sail and dive the world. Any chance of meeting you when we are in Ft. Lauderdale? Nikki…even on work days you have super stylish and comfy looking outfits…ever think about partnering up with manufacturer of your clothing and offering sales site to your admiring followers? Jason, not to exclude your great looking outfits…but, hey, I am a girl. Congrats! We are going to start opening up the additional cabins for crew after the first of the year. We will post crew opportunities here so that anyone interested can apply. We bought a big boat so we could share the adventure. So…stay tuned! Really glad we stumbled across your YouTube channel a few months ago! We’re hoping to buy our own yacht in the near future and you’re fueling our passion! I spent 10 months in Iceland and on a very cold snowy night I was surfing the web and applied for a job on a sailing boat. I didn’t get that job because I didn’t have any experience, so I did the best thing possible, booked a sailing course in Gibraltar and spent the next 4 months sailing in Turkey. It’s great learning through experience but doing a full course teaches you so much more because you learn from others experiences too. I did the RYA Day Skipper Course which seems to be a bit different to what you guys did. Looking forward to more videos of your adventures! Your videos are very informational and inspiring. The photography, audio and overall organization makes your videos a pleasure to watch. The audio was exceptional considering the windy setting on the boat. A truly fantastic job filming the onset of your new lifestyle. Thank so both very much the extra thoughts, tips and the mistakes along the way. Thank you very much for what must be an substantial amount of time to edit/compile video. Then post everything that we can watch, read, learn and share your experiences. I wish you both the best and look forward to any future videos. a. I have lived in Daytona Florida for 30 years. I share your view on the awful hot and humid climate in summer. Some people say “you get used to it”. I disagree. The best weather and temperatures in Florida are between mid October until the end of April. b. I have heard that theft while onshore could be a concern. I don’t know how prevalent it really is as I am not a boater/sailor. Perhaps you have already thought about this as you both try to consider all aspects of things & are diligent planners. 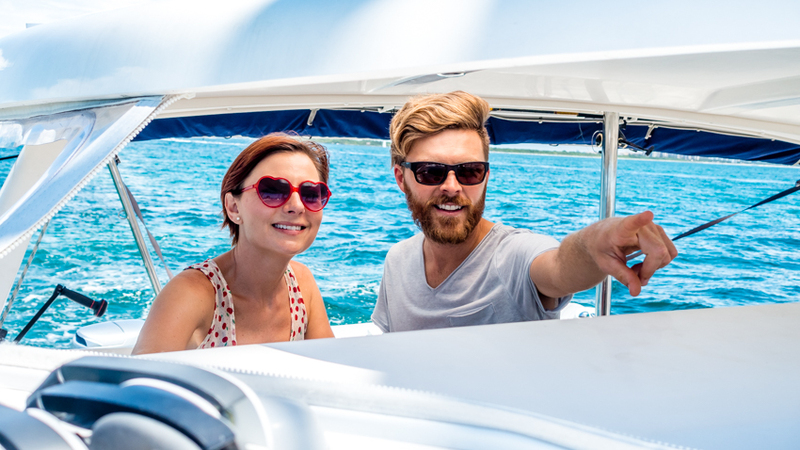 Talking with other boaters will provide greater perspective. It would be interesting to post your opinions on the matter in some future video. Thanks for the love Andreas! We do work hard on sharing but we do love it, and that makes all the difference in the world. It is hot, hot, humid and hot here in the summer! I am ready for october! Crime isn’t as prevelant as it is on land as far as we can tell. We have been soaking up as much as we can from our fellow boaters and once we feel we have a grasp on it, we will share for sure. I know it’s a question many have. I am always so excited to see a new video you post about your adventures. I have been following both of you for the last few months and I am enjoying living dreams of exploring through your videos. I chose to explore the world earlier in life in my 20’s in the Marines and now in my 40’s with a wonderful wife and two children I have a more anchored (pun intended) life. Thank you for sharing your experiences, congratulations on passing your sailing school, and keep letting us land locked mid west followers enjoy watching you. Anchors away! Funny thing …. we decided last year to purchase a catamaran and have been researching the web for the last 10 months. We’re in Ft Lauderdale for a week (29Aug-2Sep) to view 9 cats through 5 different local brokerages including Just Catamarans (JC). Well, shiver-me-timbers if it wasn’t by chance (mindless clicking) that we happened across your GWTW web site. How timely it was to view your cat purchase escapades. If you’re around the area that week and can spare some time it would be very educational to see all your boat mods (solar, batteries, compost, etc. ), broker insights (wife interested in your seller broker comment), and what you think of JCs quality of work and price. We won’t be around as well be sailing around the keys durning that time. I will say it doesn’t cost a penny to have a buyers broker (that’s what Kent was for us) and a good one is worth thier weight in gold. I don’t know who you are meeting with at Just Cats but Kent or Larry are fantastic. The best part about having a buyers broker is that they work for you so they don’t care which boat you buy…they just want to see you get the best boat for your wants, need and budget. They sift through the boat listings and weed out the really good ones, take you to see the boats and offer up thier two cents on each one. It was great for us to have that kind of knowlege and experience with us as we were looking. We’ve got a lot of videos that will be coming out about our mods and work done at Just Cats. Overall we liked the people working on our boat, the work is solid and the prices were fair. In the future, if we are anywhere near the state of Florida, we wouldn’t go anywhere else for service. Hope that helps. I’m so excited and happy for you both. Can’t wait for the next installment. 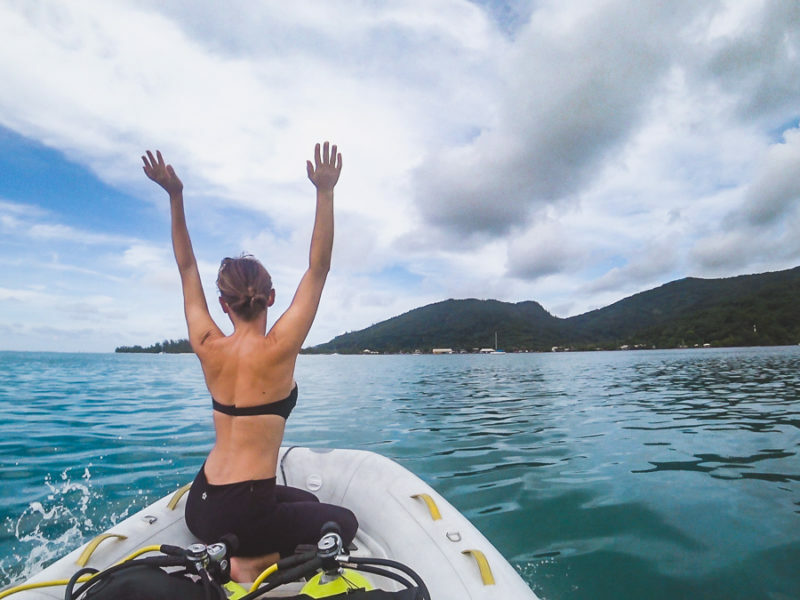 It is exciting to follow your travel log on the whole catamaran adventure, but my impression so far is that it seems like a whole lot of expense and effort just to be able to travel (very slowly) to only coastal areas. Of course it is totally inappropriate to try comparing RVing to sailing, but it makes me wonder if RVing doesn’t give you a whole lot more “bang for the buck”. But perhaps the sailing “payoff” comes when you can sail to the Caribbean or farther. A little too scary for me. Congratulations on passing. What fun. Enjoying all the videos. Mission Impossible docking by Nikki and a cast of several. I was nervous for you! It is great to be certified and your experience makes it pretty clear that the school is worth the time and money. I can imagine it was pretty pricey. It seems like you’ve had an awful lot of upfront expenses with the training and the boat repairs. Did you expect that? The boat looked so perfect when you first saw it, I thought it would be smooth sailing from then on, pardon the pun. I am looking forward to your new adventures! Sailing together will be the coolest thing you have ever done, and we congratulate you on your move to the water! Finding your way, and navigating through all the unknown things that will come along will make you realize how strong you both really are… as a team. We bought our catamaran 3 years ago, and learned our way around too, as you are now. Since then, we decided to work 6 months and play six months. The sailing season is really about six months anyway, so this has worked for us. We sold our catamaran in March ( we wonder if you saw our listing!!) and we now have a new catamaran on order, so very exciting things for us too. Contact us if you like, we would love to talk. Great Video and congratulations on finishing your class. We loved the last installment! Watched it on our smartphone while camping in the RV! Happy sailing!! Congratulations! Loved watching the videos and I can say there’s a tiny… very tiny seed planted in regard to sailing. Look forward to your solo! Happy that you have found your calling (or one of them). Enjoy, have fun and be safe. Congratulations. Now starts the adventures. Really looking forward to them. Fantastic! My wife and I loved this series of sailing school videos. Dinner table discussions of getting bareboat certified have begun! Great video set on learning to sail – on a quite impressive vessel! Congratulations to you both! Nikki you did a terrific job trying to dock in that small space… I would have been afraid to even try it, much less doing it without damaging those other boats! Super! We look forward to watching all your future adventures. I’m so excited to see you finish your school and take to the sea! I took the basic keelboat class from the Kenosha Yacht Club Sailing School in Kenosha WI on Beautiful Lake Michigan. They offer class time and sailing time on boats of volunteer captains. It’s significantly less expensive than the Chicago classes, and fits nicely into the Metra schedule. Great job on the courses – brought back memories as we did a very similar process, all in one week. The docking gets easier over time and every monohull ( maybe not every) will be envious of your twin engines maneuverability. One idea for you to consider that we had made up from our rigger – for your jibe preventer – get line with 3:1 purchase with a ratchet block and snap swivel at one end ( regular block with snap swivel at the other) put a spectra loop on the boom and one on your cleat. Then snap on to the boom loop pull the line out to the cleat loop, snap on to the loop there, pull the line tight using the purchase and ratchet lock it . We were told to try and put the line on the cleat end as far forward as possible, ours goes to mid ship. This avoids the boom potentially snapping in half ( apparently more likely if tied from the boom to the stern cleat) in a high wind accidental jibe. Great videos, we enjoy watching. We pick up our cat ( Chapter Two) this week at West Palm Beach, we shipped it 6 weeks ago from Thailand. Heading for Key West area soon, maybe we will see you out there. Congratulations on completion of the ASA courses. I really made it a point to watch this series of videos because my wife and I will soon find ourselves in a similar situation. I had thought about taking the private in St. Thomas through Blue Water Sailing School before acquiring a boat. But now it appears we have found the boat, just waiting to get all the money together. Then I will see about getting the private training on our own boat. I do have some sailing experience, but that was 30 years ago. I’m glad to see/hear that you thought the training very worth while. I will continue to watch your progression with interest. Now that you’re ready, I highly recommend the Abacos. You can be in West End in 10 hours or less and clear in at Old Bahama Bay. An hour later and you’re on the Little Bahama Bank, which is fairly protected and shallow enough to drop the hook anywhere. There is a great variety of beautiful places with no people and populated places with cold beer and restaurants. Buy the Steve Dodge book, the waypoints are spot on. Keep up the great videos! Congrats! On both passing the test, and the four informative and entertaining videos. I’ve never been sailing, and may never go sailing, but the videos were great! Nikki and Jason, congratulation on passing your tests. You two are such a good team. You actually make sailing look easy and fun. I wish you guys the best and cannot wait for future videos. PS: how are the cats doing? Congratulations, awesome job on completing the course! One thing to To keep in mind when docking is that you only control the rear of the boat, and the front moves in the opposite direction. This becomes very apparent when in tight areas as you experienced. when the back end goes 2 feet in one direction, that causes the front to move 2 feet in the other direction. Hence the close contact with the other boat in the video when backing out. Nice to have a push pole WITH RUBBER TIP, in hand for these circumstances, don’t be afraid to gently push off of another boat. Nikki can control the back quite well, so Jason, your job could be to have the push pole in hand standing on the trampoline, watching which way the bow is swinging. It’s like having 4 wheel steering, Nikki controls the back and you oversee the front, THAT WILL GIVE YOU TOTAL CONTROL IN ANY TIGHT AREA. More adventures to come – we cannot wait. Great series! We took the BWSS week-long liveaboard out of Ft. Lauderdale about ten years ago, and it was phenomenal. We have since sailed to the Bahamas (Abacos), and will be heading back this year. We are working on the best of both worlds now, with a Class B motorhome for the summers (where it is cool), and a 42-foot monohull for Florida/Bahamas in the winter (where it will mostly be warm). Hope we can catch up along the way. Yeah, made it!! Watching your skills and confidence grow was nice to watch. Oh, that docking. Pilots say, “flying is fun, but takeoffs and landings in bad conditions, is terror”. The same can be said of boating. “Keep calm and sail on”. Kent seems like a wise man to listen to and certainly has made the effort to make sure you get off to a great start… ( and I have enjoyed all of Terry’s Dad’s videos of IMPI) Hopefully his slow and steady speech conveyed the adage to “Never approach a dock faster than you are willing to crash into it”. Great job, we enjoyed following your adventures over the pass 4 years. As full time RVers we have always wanted to live on a boat and have looked at many in Washington State and came close. Your adventures makes us yearn to try again. Please keep learning and sharing, we look forward to each adventure you share. I was clenching before you guys even got to the dock. 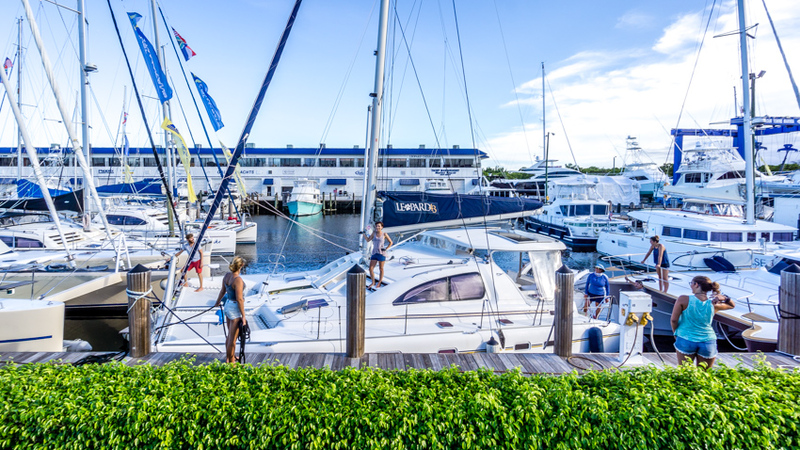 Lots of stressful memories when it comes to docking our little 24′ sailboat in Florida marinas. I always HATED that part (even though my husband was great at steering it in). I preferred to be the one with the boat-hook, fenders, and lines that jumps off the boat at the dock and pushes off obstacles/other boats. But still SOOOO stressful. You both handled it like a pro and Nikki is a MACHINE behind that wheel! Congratulations. You did a great job. I did not hear what Jason”s score was on his final test. Formal training is the best like what you had. On the open seas, your lives are in your hands during the trip and planning the trip and when to depart and arrive in good weather for the best ride. Wishing you the best. I am proud of both of you, but still a scardy cat in all of that big water out there. Congratulations on passing those tests and receiving the certificates. I’m so excited for you both. You two work so well together with all that patience. That boat owner definitely owes you that bottle, great job. I’m still dying to hear all the new adventures you’re on since your videos are 7 weeks behind. Fair sails and I can’t wait to hear more. Thanks for the inside look at what sailing school is all about. I have already been online comparing schools and BWSS was on the short list. Now they are all the list has on it.  I am going to use your promo for the discount. Do you know how long that will be good for? My plan is for this winter. Now, off to order my books and start my studies. Maybe our paths will cross! Thank you both for being a great motivators! Congratulations guys ! Im so happy that you made it and it really looked like you enjoyed the the whole class. One quick question because the only thing I have skippered is a 66 foot ,long line trawler off the pacific coast, and its was my fathers so no formal schooling, can you now do deep water sailing or are you restricted to coastal sailing? This set of videos were great! I’ve always wanted to truly go sailing (but I have an unfortunately uncooperative nemesis on oceans: sea sickness), so watching the videos made me feel like I was right there. I would definitely agree that a proper class on sailing is always a good idea. It’s more complicated than it seems! I’m looking forward to your next adventure on the water! Hi, congrats at passing. Subject chance… You do know about the renaming ceremony? Presume its coming in good time. Also I notice that you don’t have something covering the tender when underway at least, doesn’t that cause rainwater to accumulate in it? Just a thought. Keep sailing and posting vids! Great Job! Been following the two of you for about proximately 4 years. It’s been very entertaining, and may I say professionally done. Out of all the YouTubes that I watch I enjoy yours the best. keep up all the good work. And hope to see you on the seven seas and bringing us all many many memories. I’m stoked for you two, this is huge! I am thrilled for y’all and so proud of your huge accomplishment!! Y’all are so smart and oh my, what fun you’re going to have sailing. I’m so envious! I wish I was out there with you. Fair wind and following seas, you darling kids! Thank you so much for filming your Sailing School adventure…I have lived through all of it right along with you because of your excellent filming and blogging. This has given me a much needed break from all the crazy political shenanigans and insane violence out there in the world today. I feel so blessed to have been able to share this with you – it was the good kind of stressful that is essentially an escape fantasy for me. LOL Congratulations on surviving the class and best wishes for happy sailing. Looking forward to more! Love your videos. Always well done, articulate, and informative. I was a member of their sailing club for a few years and sailed on a couple of short Parasailor Demo sailings where they were doing a demo or training for clients who purchased one or were interested in one. Have only done these sailings on a monohull but understand they work very well on a cat. If you do look into it, just ask for Marty and tell him Hank Wacker put the bug in your ear. He may charge you more for the sail then, only joking,. These are not cheap!! Nor is anything else that needs to go on a boat as your well aware of. Such an awesome job guys. Way impressed! Isn’t it amazing that just a few months ago, you probably wouldn’t have thought you would be so successful in your efforts to learn how to sail. Now, with some more practice so you get to a point you can sail without too much effort, you will be off to the ends of the oceans (because you will probably be in a number of oceans in you sailing lifetime). Good luck and I hope you will continue to share your new life with us. OK, guys….. I feel like I have worked for a week non-stop just watching you do your check list…. When can I just go for a boat ride and have fun. Never, Never could I do what you are doing. I do not have the patience for it. You guys are doing it right, you learning first. I just jump in… then I realize it’s quick sand. Have fun, be safe. Hi, We just became RVers. And decided to take a driving class. It was the best thing we could have done. Learned so much as you have. Good luck on the seas!! Congrats to you both. Job well done. Dido on all the other coments. Thanks for letting us be a part of your life. It’s very interesting to see the skill and confidence you both demonstrated when docking the boat in this latest episode. I hope you can take the time to watch yourselves doing an excellent job of docking a big cat in a too small space. Congrats on passing your class. Looking forward to more great videos. The videos are so informative. Great job docking. Doing the hard stuff will make it all easier later. I was literally cringing watching that too-tight docking!! You guys managed to handle everything MUCH better than I would have! (I wouldn’t have tried it in the first place because I’m a complete wimp!!) Nikki deserves that bottle of scotch should it ever arrive for her steely docking skills, and Jason deserves his own for not coming unglued!!! Congrats on passing all your classes and tests!! You guys are a pleasure to watch on these videos, and I know that your eventual charter op will be a success. Thanks for letting us all tag along!! We loved this video. Brought back a flood of memories for us. See, we are kind of doing your life, only in reverse. Five years ago we decided that it would be a good idea to “pretire” — we were in our mid-30s — and head off across the Pacific on a boat. Only we didn’t have a boat, had never had a boat, and didn’t really know much about boats. Everyone told us we were nuts, we were going to sink or be captured by pirates, that starting with a 50′ boat wasn’t “how it was done” — apparently we needed to buy a wakeboard boat first and then “step up” in 10′ increments. Whatever; at that rate we would have been out cruising in our 60s. So like you we figured out ways to start addressing our lack of education experience, and after a year of practice and research and fixes and upgrades and talking to everyone we could, we set off for Mexico from San Francisco. After a month in Mexico we pointed the bow west and embarked on the most interesting, challenging, frightening, and freaking awesome year of our lives. Once in Australia we spent a season exploring and drinking Flat Whites before returning to the Bay Area where I have a software company. So what’s the “your life in reverse” part? Well, the boat came home too, eventually, and we sold her because boats have to be used or they get depressed. But we’ve got the exploration bug again, and we’re not ready to do the ocean crossing thing again just yet. So we just picked out a Class B+ and plan to hit the road in the next few months, starting at maybe 1/3 to 1/2 time while we figure it all out. And Jason, I’m with you: Eve always did all of our docking, because she’s just cool as a cucumber that way. Nice work to you both. You’ve got an awesome new adventure ahead of you. Fair winds, as they say, and following seas. Hope someday to meet you and exchange advice on the stuff we each know best. First… Adam and Eve!? That stuff can’t be planned which is what makes it so much more amazing when it just works out that way. I once knew a woman named Mary and she ended up marrying a man with the last name Christmas. She was then Mary Christmas. No lie. Ok, back on track. I love your list of things you identified with. It really is the challenging bits that bond us travlers together without ever meeting. We would love to meet up if we get the chance! The RV/Boat thing go together like peanut butter and honey. So impressed and love following you guys!! Congratulations!! Looking forward to the next installment. First – Jason at the bow keeping the fender in place under that other cat’s bow. Second – Jen at the stern holding THAT cat from pushing harder on your dinghy. Congrats on getting your certifications. Hope the continuing education is as fun as you made week look. Congratulations Captains Niki and Jason. May the wind be at your back and the sun overhead. Happy and safe sailing. ? Congrats. Wishing you safe and adventurous sailing. Great job on passing your ASA teats. I have been following your adventures and am very impressed with your transition from wheels to sails and the measured approach your are taking as the sea can be a lot more challenging environment than the road. My wife, Joellen, and I are making the opposite move for sail to wheels. We cruised our 45′ monohull from San Francisco to Florida via the canal. Now after a few years break we’re shopping for a motorhome to “cruise” the US. I am learning lot about the RV experience watching your videos and reading your blogs. One rigging suggestion. It seems to me that your port jib winch is in a poor location if you ever need to make a quick tack and/or only one of you is available to manage the boat (multi-day passage with just two aboard). The newer Leopards have the port jib winch at the helm along with the main sheet winch and starboard jib winch (shared with the main halyard). As always I love your videos We just bought a Motorhome and I have owned lots of camping trailers so I thought I was prepared. There is so much to figure out! Just trying to decide what my tire pressure should be is challenging! Long time one design sailor. Lightning, J22, Flying Scot, Force 5, sunfish. Have really enjoyed this series, thank you. Loving every minute of your videos and photos! Watching you make mistakes and then getting things figured out. It is very entertaining! A lot can be learned in 5 days. I’m along for the ride (sail). U2 congrats u have worked hard and knowledge is power. Doing the schooling is important ur on ur way to mighty big advedtures and thank u for taking us along. Look forward to see more videos … Oh ya and on ur patron page can u add a BUY ME A GLASS OF WINE… Some of us would like to do the one time present to u as u know money is tight but when we have abit more on a good month we would like to help u out. Be safe and god bless u both? We’ve been “snowbird” cruising Florida for the past 19 winters and lake sailing the Midwest for 30 years before that. Great that you are joining the adventure. If you get to the west coast of Florida, look us up. We winter at Fisherman’s Village Marina in Punta Gorda. It’s a great live aboard community on Charlotte Harbor. Thoroughly enjoying the website and all the hard work that goes into the video production. Keep up the great work. Quite the transition from RV to Catamaran! Glad to see you enjoying the fruits of your hard labor. Hey guys, enjoyed all of you sailing/training vids. 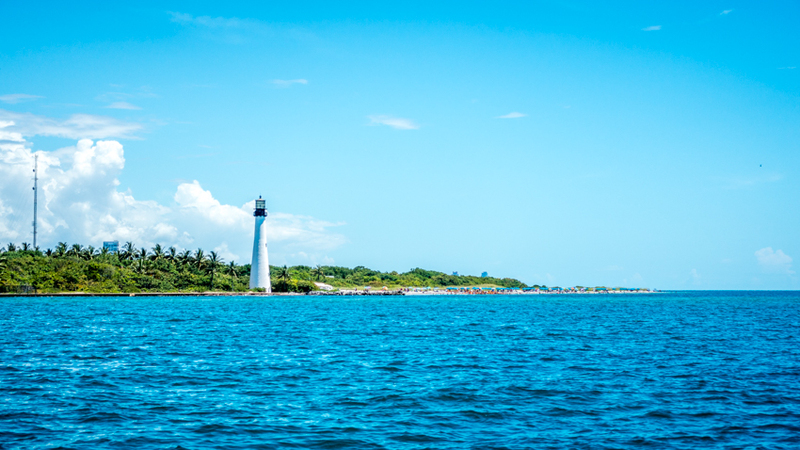 My wife and I chartered a monohull in the same area of Florida and also spent a night at Boca Chita key on our way to key Largo. Nice little harbor. There is also a nice harbor up near Miami, no name harbor., with a restaurant. We still are trying to sell our Hunter DS, if you know someone looking for a mono. Congratulations to both of you for a job well done! My palms were sweaty watching you all docking haha. Question: Do you have to have a cert to use your own boat? Or, is this a Florida requirement? Great series! The only thing I found myself wondering throughout the series was what each of the four classes set you up for? Do they all just give you the “captain” competency relative to insurance? Or would just one (or two?) have done that and the others added additional certification to support other intents? I was hoping they would answer this question as well. Were you guys successful in getting insurance once the course was completed? What insurance company would you recommend given your experience and ASA courses? Thank you! I’ve thoroughly enjoyed following you through the search and acquisition of Curiosity and the completion of sailing school. Your new adventure – inspired me to buy another sailboat after a 35 year hiatus. We’ve restablished ourselves in FL for a retirement of adventure and fun. Happy sailing, fair winds, and many excellent adventures! What does Patron offer that we don’t see here? or is Patron a way of showing appreciation? Can you tell us more about Patron? I can’t speak for the Wynns, but I contribute to their videos via Patreon in order to show appreciation for content that I think is fun and interesting. You can see their Patreon homepage at http://www.patreon.com/the-wynns. In a nutshell, you can sign up to contribute at levels of $2 or $5 or more per video. Their intention I believe is to put out about 4 videos/mo. Patreon bills monthly, so you would expect to be charged $8/mo or $20/mo or more, depending on your support level.  Higher support levels give you added perks and supporter-only content as noted on the site. Congratulations you two. That’s great. Yesterday you couldn’t spell sailor, and today you is one…………well two. Now the real fun begins…. Congratulations! Congratulations on passing your tests, well done. Have so enjoyed your travels on land and now on water and wish you well. Looking forward to watching you sail “Curiosity”! Congratulations on passing all your exams. I’ve not been on the water in a few years. Watching your “schooled” videos brought back wonderful memories of my own experience getting my ASA 101, 103, & 104 certifications. For anyone looking for training in San Diego, CA, I highly recommend Seaforth Boat Rentals & Sailing Club. Wishing you fair winds and safe travels. Do you know if you would have had to do all the schooling it you had purchased a motorized boat or is the schooling just for sail boating? I can’t say how useful and enjoyable your Schooled series has been. I got the sailing bug three years ago and once I’ve wrapped up this graduate degree non-sense I’m trudging through I’ll be orienting mine and my families lives toward a nomadic sea life. There is a high likelihood that I will be building our catamaran for both cost and pleasure reasons. As an architect and former home builder the challenge of boat building is terribly exciting. That said as a designer some of the most import research isn’t about materials and scantling formulas its about seeing how people use the boats under sail, power, and for living. Folks like yourselves who open up their experiences to us land-based dreamers are doing a huge service toward making nomadic and alternative lifestyles a truly global force. Keep up the great work and thanks so much for sharing! I have thoroughly enjoyed your series! It brings back memories of sailing with my husband on our CT 41 from Vancouver, Canada to Acapulco. My sister and her husband have the same boat as you. They live on it in San Diego. Congratulations for passing your course! Congratulations to the two of you on passing your final exams. Can’t wait to see videos of your adventures ahead! I can’t wait until you sail to BVI and, my favorite, Grenada. Fair winds and following seas. We enjoy your web site and videos very much! We’re in our 70s and past the point of doing what you’re doing but are living vicariously through you two! We started following you during your RV travels as we still do some of that but are realizing that it’s probably time to move on to a different form of travel. We’ve owned a couple of Sea Ray cruisers and have even sailed on very small vessels a time or two, we’re down to a Lund fishing boat now! 😉 We’ve squeezed in as much as we’ve been able over our 50 years of marriage and have no regrets. We hope you continue to enjoy your adventurous lives so you too will have no regrets! Happy and safe sailing! Looking forward to many more videos and articles. Thanks for letting us follow along! Peggy, your post is the best. Cheers to 50 years!! Thank you Trixie! That’s very sweet!